ReQuest Serious Play: Ready to Upgrade? Why upgrade to a new ReQuest system? Over the last 4 years, ReQuest has made huge strides in our video solution moving to an entire digital client-based model. 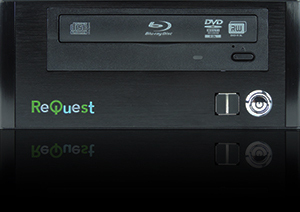 Just plug one of our MediaPlayers into any TV or projector in the home and it turns your current generation ReQuest server into a complete digital movie powerhouse. We've added online radio and streaming services to the basic ReQuest system, blending the choices seamlessly into the same interface as your existing music library. By integrating with the MySqueezeBox.com service, a myriad of services are now available1. Always ready to play, ReQuest stands apart from our peers when it comes to functionality and product support. If you have an outdated ReQuest system or want to move on from another obsolete home theater solution, we've made it easy. Just download our upgrade form and fax it in and we help you find an installer in your area to help you with it! Just want to keep up with the latest product updates and features? 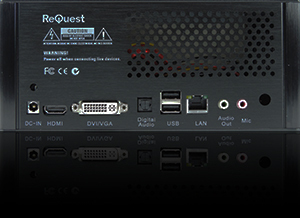 Since 1998, ReQuest has been the leader in Audio server technologies. In the past 2 years, we have added a lot of new features to the Audio product. The F3HD server is our flagship product and primary workhorse server. It maintains the power and intelligence of the ReQuest system, while using the newest technology, lower power consumption, less heat, and more processing ability. We respect you, the customer, for staying with the ReQuest brand. We are pleased to extend this opportunity to upgrade your system by trading in your old ReQuest server for a new, state-of-the art ReQuest F3HD. With the new F3, you not only get a fresh warranty on your server, you also get free music transfer to the new system, access to dozens of online music streams1, Maestro for remote control and streaming, and many other features. Ready to upgrade? Click here for the upgrade forms. 1 STREAMING DISCLAIMER: Online and streaming services are provided by integration with a third-party service aggregator, MySqueezeBox.com. Available services are subject to change without notice. Not all services are compatible with ReQuest devices. Compatibility with any online service is not guaranteed and may be terminated by the provider or aggregator at any time, or upon request of the provider for discontinuation of service. Use of any online service is subject to the terms of service from that provider. ReQuest Serious Play LLC is not responsible for violations of service agreements or discontinuation of service by any particular provider.